Selecting women for the combat role in armed forces has always been a crucial step for the top brasses. Recently Army Chief General Bipin Rawat said that as women in the Kashmir Valley are taking a leap toward the activities like stone pelting, it is being seen as a requirement of women soldiers in the combat duties to counter the protest going on in the valley, where male soldiers find it hesitating in responding to the female stone pelters. Indian Army has selected women and deployed them in various services like engineers, education, signals, administration etc. But General Bipin Rawat quoted that recruiting women at Jawan level seems to be the need of the hour. The ongoing unrest in Kashmir Valley has raised several other political and social issues and it has somewhere started hindering the development of the area. Once known as the natural beauty, has somewhere changed to the conflict zone. General Bipin Rawat has also quoted that youth has been instigated to do these unsocial activities by the campaign on social media which is redirecting the youth from their actual developmental path to the unsocial acts. Well, women have been deployed in several other security forces like reserve forces and at constable level also in the state police. Similar to that Army also seems to be ready to recruit women at the root level of Army ranks. 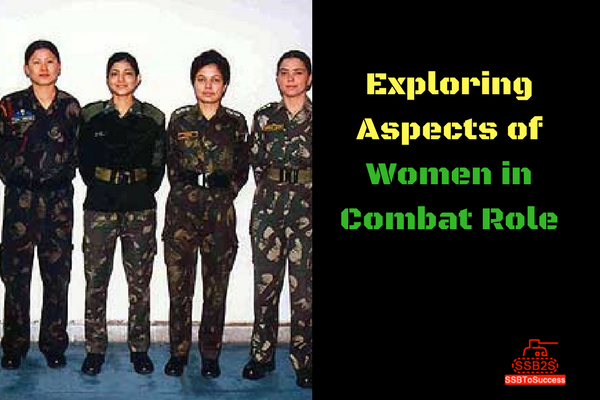 As every social issue has got some pros and cons, the issue of introducing women in combat role in Indian Army has also got some pros and cons. Firstly, talking about the pros effect, introducing women at Javan level will help tackling women stone pelters in Kashmir Valley, as well as it will increase women empowerment and equality of job among the women. It will also explore new ways for women to serve the nation and change the tradition and cultural differences among the sexes. Women can also opt for career advancement in the same field. Talking about the cons there are certain cons of introducing women in these areas like physical ability, which women can’t match with the men’s physical stamina and will affect their efficiency. Military readiness has also point of concern as men are easy to train and need less maintenance (leave in case of women pregnancy leave maternity leave) and other such issues. Well, along with that abuse of women by the enemy is also a point of concern. Going with the stats, women constitute about 12.8% of the defense forces strength of Australia, while Nepal has 30% female quota for Combat forces. While in France and Russia, the counts are 15% and 10 %. In the US, women serve at about 10% of the active army standings. Indian army has just 4% of women share in its strength. The count is far behind other developed nations. But the current ignited political and defense scenario seems to be in favor of the women. The step is not easy to be implemented. Rather measuring certain conditions and deep judgment of the moves to go with the decision is needed. The current requirement of the women to handle female stone pelters has been seen as a need of the hour. Like Indian air force and navy, the army also seems to be strengthening itself with the best female soldiers at lower ranks in the upcoming days.